Strider is one of the best know brands of balance bike in the UK and around the world. However, it can be a challenging to figure out what is the best version of Strider to get for your child. This article compares the 12 inch versions of the bike, the Strider Classic and Strider sport. Well find below a table which sums it all up. Weight - both bikes weigh 2.9kg. When the extra seat post is added to the strider sport it increase the weight a little. For little kids, lighter balance bikes are easier to control and manoeuvre but as children grow, get bigger and stronger the low weight is less important. Ideally a balance bike should be no more than 1/3 of a child's weight to ensure it's a good bike for them. They will then easily be able to move the bike up and down kerbs and steps to get indoors etc. Frame - both bikes have a 12 inch steel frame. Tyres - the sport and the classic both feature EVA polymer tyres which have the bonus of never getting flat and no ongoing maintenance is required. Footrest - both the classic and the sport have a footrest. The footrest is positioned so it tucks in beneath the seat. It doesn't get in little one's way when they are using their legs to power on. It will mainly depend on your budget and the age of the child you are buying for. For a child aged 18 months to 2 years, either bike would be suitable. Go for the classic if you are on a budget. If you have the extra money, it's worth spending a bit more on the sport as it will last your child until around age 5 when most children will be ready to transition onto a bike with pedals. Both the sport and the classic offer one of the lowest seat heights available on a balance bike which makes it great for the smallest of users. To find which seat height you need for your child, measure their inseam (inside leg) and take off 1 inch. This will be the measurement of the seat height that they need. A child's feet will need to be flat on the floor to push the bike along. Find out how to measure an inseam here. If you are buying for a child who is approaching 3, it's probably best to get the sport as you won't get a lot of use out of the classic as most kids will grow out of it by their 4th birthday if not before. The padded seat that comes with the sports means kids will be comfortable on the bike once out of nappies. 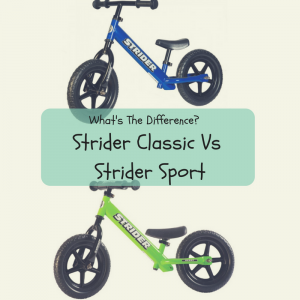 Who Are Strider Balance Bikes Best For? Young and small toddlers / children - Toddlers from 18 months to 2 years are ideal candidates for this balance bike as it's lightweight so will be easier for them to use. They will also get a lot of use out of both bikes whether you go for the classic or the sport. Siblings - the sport is a great option to share between siblings. The seat height is easily adjustable. Children who are age 3 and taller than average - make sure you measure a child's inseam to ensure they have a couple of inches of growing room left on he bike. Ideally a child's inseam should measure 1 inch less than the minimum seat height that they need but also look for a maximum seat height which is at least 5cm (2 inches) greater than the child's inside leg measurement (inseam) so that there is some growing room.Also don't buy the classic for children approaching age 3, go for the sport as you will get little use out of the bike before it gets too little.